It should be obvious, I hope, that Ingmar Bergman was a director I loved, who was in the front rank of my personal pantheon. That made writing about his work a pleasure (separate from considerations of the occasion for my doing so). But not Michelangelo Antonioni. The other European 60s-art-house star-director who died apparently the same day (though it wasn’t reported until the next) and so will forever be linked with Bergman, was not a personal favorite. But still — appearances here sometimes aside, I don’t think sneering “over-rated” (as this twit did to Bergman) is very productive. And not simply on “speak no ill of the dead” grounds. 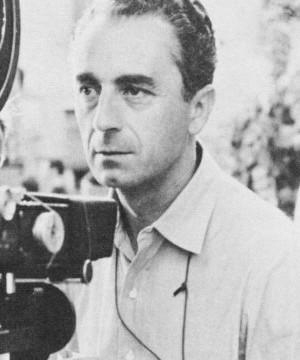 You just don’t get to Antonioni’s canonical status without there being SOMETHING to your work, and too many critics whom I esteem considered him as great or greater than Bergman. If you have a serious interest in film, you simply MUST come to grips with Antonioni and give him every chance to engage you, even if ultimately only for slamming rights. Eventually, you will find a canonized director whose films do little or nothing for you. But rather than sneer (as this twit did to Douglas Sirk) … why not consider that this is a blind spot of yours and a personal shortcoming. 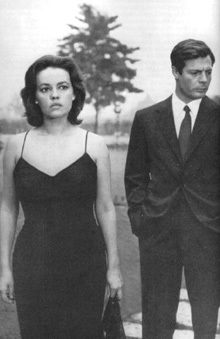 So I’ve seen Antonioni’s L’AVVENTURA and LA NOTTE at least six times each. And over the years, they did in fact grow on me somewhat. This picture above is from near the end of L’AVVENTURA and the one to the right is from near the end of LA NOTTE. Note how in both cases, the couples eyes show how they are miles apart even while right next to each other. Both films are about tired, alienated people just tediously going through the motions. Antonioni was also so laborious in his story-telling technique that Pauline Kael championed L’AVVENTURA (she turend against Antonioni later) by comparing it to Henry James when “he chewed more than he bit off.” My bud Adam called him yesterday “an inaction director.” Most of the time, Antonioni develops his drama (not “tells his story”) not merely through indirection, but also through landscapes and compositions. He once, in RED DESERT, famously had a marsh painted gray because the color was how the protagonista felt when she looked at it. It’s not simply (as Adam said) that Antonioni’s movies were harder to “get into.” No … I think at least in my case that my longtime resistance was simply seeing his early-60s movies for the first time at too young an age (about 24-26 in all cases, if memory serves). But far more than Bergman, Antonioni made middle-aged movies, rather than for “boys who have just heard that God is dead.” To overextend the metaphor, Antonioni’s movies are about people past caring about whether God is dead. About souls burned out beyond their ability to care. It was a view of life, an emotional state that I simply could not tap into in my mid-20s and I don’t imagine that many people can. But then a couple of years ago, it finally happened. I saw the Antonioni movie that really sent me — the fall 2005 30th anniversary theatrical rerelease of THE PASSENGER. “Do you speak English” are the first words in the film and a drier opening line has never been written. The first few scenes take place in gorgeous desert and you’re thinking “LAWRENCE OF ARABIA,” particularly when a man on a camel is seen at a distance. But instead of Omar Sharif’s famous entrance, the man simply passes by. A guide boy suddenly runs away from protagonist Jack Nicholson for no reason. We are quickly at sea in the world of human non-relationships and so journalist Nicholson finds a dead body and assumes his identity (for no particular reason beyond “why not”) and gets involved with his business. I think THE PASSENGER probably is Antonioni’s most-accessible movie because it does have and mostly retains a thriller-like plot — intercutting in a kind of “chase” between Nicholson’s assumption of his new identity and the people who knew him trying to track him down while he gets in deeper with these bad guys. You could build a typical summer blockbuster around that narrative skeleton, but Antonioni is not interested in that. There’s some lumpy metaphor early on (a Land Rover trapped in sand dunes). But having this plot solved the problems that Kael and I at least had long had. Nicholson is as tired with his life as any of the characters in Antonioni’s early-60s Italian films. But his condition is not universal (there are people interested in finding him); he also does something about it (get another life). We thus get more of a sense of the kind of person he had been or could be, rather than pure existential defeatism. There also was more humor than in his Italian films, like the African who says all white people look alike to him. The slipperiness of identity is also simply a much better theme than the slipperiness of reality (I really really REALLY could not relate to BLOWUP for that reason) There’s also the possibility of a real restart held out, in the person of Maria Schneider — shades of LAST TANGO IN PARIS. But most of all, I think, that I saw THE PASSENGER at 39 and already dreading next year. The theme of the man who wants to leave his life behind and start over — that now means something to me and can resonate with me. I left THE PASSENGER feeling a sense of discovery as if I’d found a new great auteur to explore. Antonioni had finally “clicked,” and I made a mental note to give his other films a fresh look in light of THE PASSENGER. In fact, now we all have more reason than ever to do so.